The lesson strives to help students create awareness of self and self-image through transformation. While exploring contemporary culture as viewed in media, visual arts, music and advertising they can understand how it affects their lives. They will witness transformation through images presented and consider their own future possibilities as adults. The meaning of this project lays in contemplating change as it occurs in everyday life for the betterment of self and people around them. Creating a digital photo manipulation can serve as a tangible catalyst empowering students to realize their own potential. 1. How can a transformation affect you on a personal level? Now or in the future? 2. What are some products in visual culture and how do they influence your life? 3. What ideas do you want to explore for a self – transformation? What kinds of images and objects in contemporary culture in the media, art, music, film and advertising to you respond to? Students will examine the transformation process and develop personal connections within their relationship to self, their true beliefs and values. Students will begin to understand how visual culture shapes our lives. Students instructed previously to bring in objects from home they personally respond to. They will be looking at images of pop culture including, designer labels, Manga, i phone and you tube. They will watch the music video, Empire State of Mind, http://www.youtube.com/watch?v=0UjsXo9l6I8. Handout on visual culture, ref., WIKIPEDIA will be distributed in class for students to read. Students will view the power point Transformation of Self Influenced by Visual Culture. Group discussion and brainstorming on the importance of self-transformation. They will think about how they view themselves now and how they could change to better themselves and become more like what they want to be. I will explain that Cindy Sherman’s work is based on relationship to herself and the influences of visual culture and role-playing. How can you strengthen your internal relationship with self through transformation? What kind of job would you like? Are you a celebrity? Sports star? Political leader? Who are the people that inspire you to create this new self-image? What objects will you need in your life if you are this person? Students will assess their personal values and their aspirations of what they might become. It is an attainable transformation or fantasy? View images of cultural icons, Obama, Derek Jeter, Lady Gaga, JFK, MLK, etc. and discuss who they are and why would you like to become like this person or not. Think about personal options. 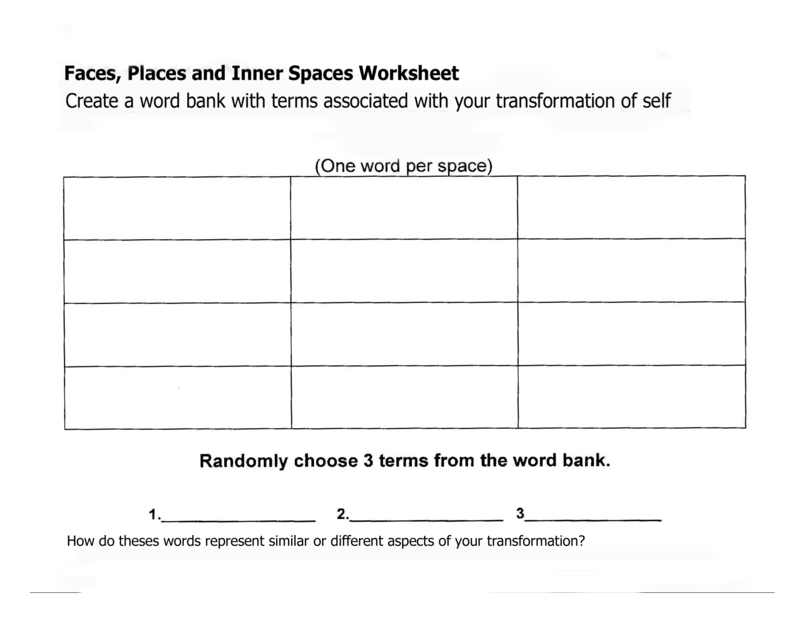 Students will complete worksheet 1 in class. How can I separate real life from the fake and superficial? How do images that we encounter everyday through visual culture shape our lives? How are people transformed by clothes, make up and hair? 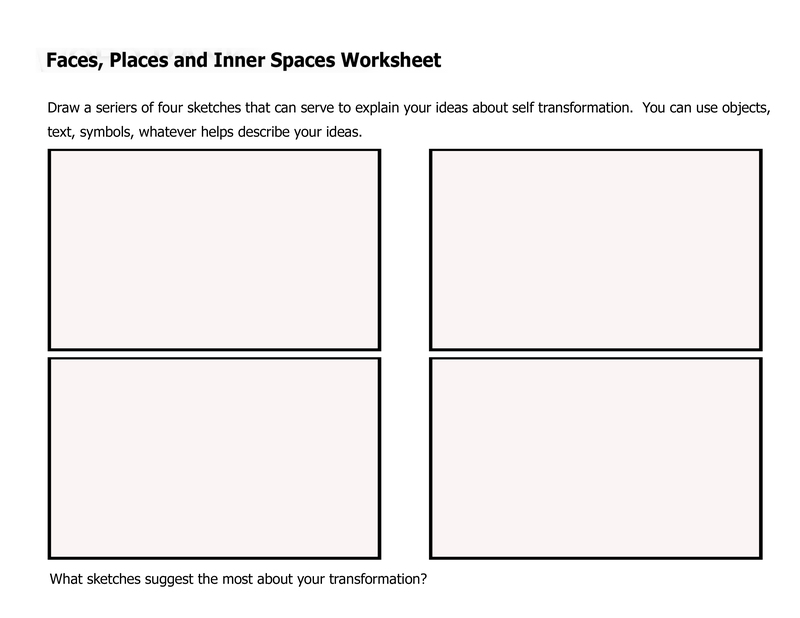 Students will draw 4 sketches of ideas about their transformation for worksheet 2 in class. Students will hand in worksheets for formative assessment. How can I translate my ideas on a meaningful transformation through art that is unique and someone else can understand? Students will be exposed to ways of creating a personal transformation through photography and altering images. Students will be directed to http://pshero.com/photoshop-tutorials/photo-effects/grunge-photo-edges for more ideas on digital manipulation and I will have the book, Mixed Emulsions, Altered Art Techniques for Photographic Imagery, by Angela Cartwright, 2007, Quarry Books. Beverly, MA, available in class for students to look at as a techniques reference. Peter Blake, http://www.youtube.com/watch?v=AYY-3iYVzpk, pop culture and London Art Bus, http://www.youtube.com/watch?v=qS4ScI2ZCsM by Diane DiPrima. Give examples of few various interpretations that could apply to these pictures. Name some similarities and differences in ideas, style and symbolism. Prompt students to think about what are the artists trying to convey. The second video – London Art Bus, can be skipped to save time. The lesson plan requires 7 to 8 class sessions, one hour each. 1. Students will realize the purpose of the personal transformation. 2. The student will push their imagination beyond the obvious answers to develop an interesting and thoughtful art piece. 3. The student will understand how a photographer works in trying to convey a clear persona. How can you identify with another artist and then create my own representation of a personal transformation? 1. Students will take at least 6 digital photos of themselves or someone take them of you. Mix it up, choose different settings, positions and expressions if you like. 2. Review your photos and pick one you like the most. Print it on letter size paper and make 4 copies of it. 3. Cut and paste yourself into 3 different backgrounds or scenes, (ideas can be from your previous worksheet sketches) and place yourself into your transformation in terms of relationship with self. The students will complete a finished photo-based artwork based on their investigation of transformation of self. They will need to apply at least one of the following strategies explained here within their final piece. Apply your image onto a 3-D or unusual substrate to create a sculptural piece. Have fun! This should be an exploration of self, containing unique and expressive qualities. Share with the class the teacher made example, “Ginger” and explain the techniques involved in making the piece. Students who are unable to create a PhotoShop manipulation will be allowed to create a photo collage or montage with traditional media. It must meet standards to grade level for neatness, composition and critical thinking skills. Students are thinking introspectively about themselves now and what they can become. They are creating meaning to an intangible idea through self-expression. Each student will analyze the images and objects seen in everyday life and determine their value. This will provide an avenue for them to feel more connected to their personal life goals and express their ideas concerning their futures. The students will be able to critique and discuss each other’s transformations. Their interpretations will help determine how successful the student was in creating their art. This will also give each student the opportunity to explain their personal work and it’s meaning. All students are required to create a “finished” photo manipulation for a passing grade on this project. This project work may be used as part of the larger display for “Arts Week” so it should be assigned in the first half of the semester when students often do their best work. Teacher attention may be needed to review some program functions and practices with some students. The majority of this project will be created during class time. Making meaning through creating art helps students to realize that their work has value and is more then just an exercise in techniques. Students can relate to their own ideas about self through self-expression. This project emphasizes the importance of knowing what is real and fake in the images presented to us in visual culture on a daily basis. The application of photo altering techniques to create highly crafted and thoughtful imagery can serve to develop a greater understanding of personal values and future aspirations. All images appearing on this website are property of Linda Walker, copyright, 2013.